Today, Prince Félix was at the 68th Cannes Film Festival to attend the 13th edition of Le Marché du Film. He visited the Luxembourg pavilion and met with professionals from Luxembourg who are working in the film and audiovisual industry. As it turns out, the film Le Tout Nouveau Testament, co-produced by audiovisual professionals from Luxembourg, is among the film selections at the festival and will be shown on Sunday evening. Also there were Minister of Culture Maggy Nagel and Film Fund director Guy Daleiden. 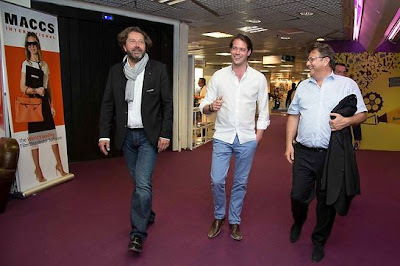 In the evening, Prince Félix attended an event organized by the Luxembourg National Support Fund for Audiovisual Production (otherwise known as the Film Fund). For a little more about the Luxembourg government's participation in supporting the audiovisual industry in the Grand Duchy, see here. More photos at Wort, as well as a video interview with Prince Félix.